My favorite part about Sundays has quickly become having my orange juice mimosas at my weekly brunch down at the neighborhood bar and grill. They are so refreshing and tasty. Plus they’re somewhat healthy with all of the Vitamin C, right? I had never thought about there being variations on the traditional mimosa, but after sampling some other variations recently, I decided to look. Sure enough, I found a number of fantastic variations that I am eager to try. Maybe you would like to use a cousin of the regular orange. Perhaps you enjoy the taste of your orange juice mixed with another fruit juice or a splash of syrup for flavor. Some of these even use different kinds of liquor for an added kick. 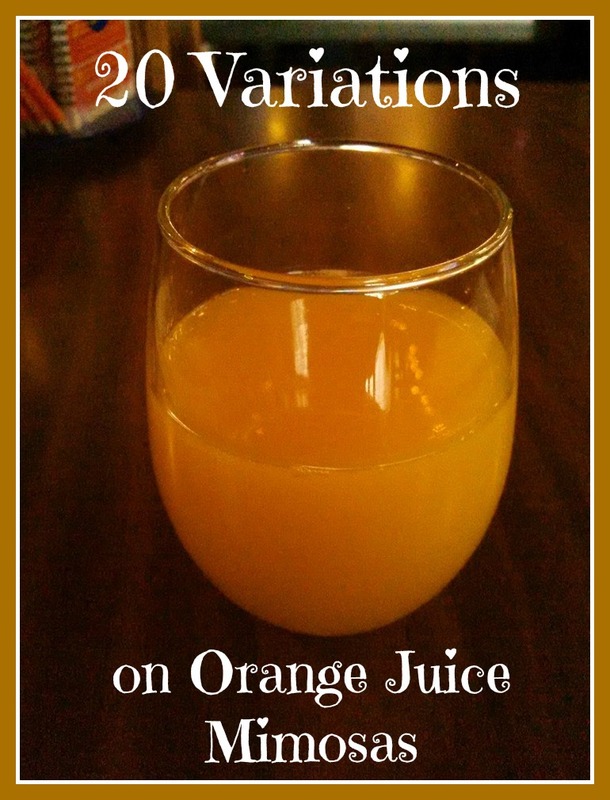 So, here are some variations on traditional orange juice mimosas. Which ones would you like to try? Tangerine Mimosas – The tangerine is the sweet and tasty cousin of the orange, so of course it would make for a lovely adult beverage treat. Baker By Nature has this yummy version that includes an extra kick with some vodka! Mandarin Mimosa – Also related are mandarin oranges. They have always been one of my favorite snacks. Laylita’s Recipes relives her childhood in Ecuador by juicing mandarin oranges for her mimosa. This would be so sweet and refreshing! Bleeding Mimosa – Somehow this drink from Domestic Fits makes me think of Dexter. It’s the whole blood orange thing and the fact that I just binge watched the entire series again on Netflix. I think even he would approve of these. I love the ingenuity of freezing the orange juice and letting it melt into the champagne, giving it that bleeding appearance. This would also be great for Halloween! Lemonade Mimosa with Blood Orange – This version from Sugar and Charm may use lemonade as the base, but then adds blood orange juice for a mix of sweet and sour before adding the champagne kick. Blushing Mimosas – Pineapple and orange juice mixed together is a sweet treat that I love in the morning. My Recipes has the two paired up with a splash of grenadine for a sweet and beautiful cocktail. Lazy Sunday Mimosa – Food Network uses half blood orange juice and half pineapple juice as the base for their version, also recommending a bit of Grand Marnier for added flavor. Strawberry Pineapple Mimosas – Damn Delicious creates my favorite mix of orange juice and pineapple juice in this mimosa and then garnishes with thinly sliced strawberries. Sunset Mimosa – A Cup Full of Sass takes a traditional mimosa and gives it a colored flair with a splash of raspberry syrup. That sounds absolutely lovely! Cranberry Orange Mimosa – Recipe Runner gives a traditional mimosa a hint of flavor by adding a splash of simple cranberry syrup. This is perfect for those who like the taste of cranberries, but don’t like all of the sweetness of the juice. Mimosa Sangria – Mimosas and sangria are two classic beverages for get-togethers. Sprinkled With Jules found a way to put the two together. You have to do some preparation ahead of time, by way of a few hours or overnight. But it’s totally worth it. Mimosa Punch – This is somewhat similar to the sangria recipe, only you prep in advance with some Grand Marnier. Serve it the next day with the champagne and you are good to go. Thank you, Susie Homemaker, MD for the idea! Orange-Peach Mimosa Slushies – Climbing Grier Mountain brings a summery feel to the classic morning treat by blending orange and peach slices to thicken the icy orange juice mixture and to cool off. Frozen Cranberry-Orange Mimosa – Crunchy Creamy Sweet also likes to freeze her juice ahead of time. She freezes cranberry juice and orange juice separately and then blends them into a slushie. Keep them separate for a layered look or blend the all together before adding the champagne. Recipe Girl does something similar, just not frozen juices. Mulled Orange Mimosa – We traditionally think of mimosas as being a nice chilled brunch treat. But what better on a cold winter morning than a hot beverage? All She Cooks came up with this simple and tasty hot version that you can make in a crock pot. Mimosa Margaritas – Blending the best of both worlds, Tablespoon takes the idea of a mimosa and turns it into a margarita. It reminds me more of a tequila sunrise. The Blond Cook actually does do half mimosa and half tequila sunrise in her Tequila Sunrise Mimosa. Both of these sounds fantastic, as I love my tequila! Kentucky Mimosas – Forget the champagne! Use club soda to make these drinks fizzy and bourbon for a kick. The Bitten Word teaches you how to cook a sugar and sage syrup for added flavor. Mimosa Moon – Hampton Roads Happy Hour brings new color to this breakfast treat by adding Blue Curaco to a traditional mimosa. Amaretto Mimosa – I think Mommy of a Monster is my new hero for introducing us to adding a shot of amaretto to a traditional mimosa. She even mentions in her post something about almond champagne. Where is this loveliness hiding? This one is at the top of my list to try.